Outstanding! Pierce Brown has done it again! 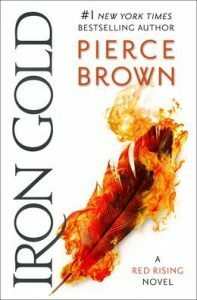 Five Stars for Iron Gold— the much anticipated first book of a new trilogy which continues the story of his Red Rising series. Iron Gold picks up ten years after the events of Morning Star, with Darrow “The Reaper” of Lykos and Virginia “Mustang” au Augustus leading the new Solar Republic. I was one of the lucky fans who received an ARC of his latest novel and I couldn’t be more thrilled at the opportunity to be one of the first readers to set eyes on these pages. For those us who are still reeling from the high octane, action packed rollercoaster ride of Morning Star, the start of Iron Gold will feel like a much needed relief from all the adrenaline. While for fans it has only been a couple of years since the conclusion of Morning Star, for our heroes it has been ten years since their victory over the Society. A lot has happened, and the author is patient in reintroducing us to this world and the events that transpired. In addition to reacquainting us with some of our favorite Howlers, Peirce presents us with a whole new slew of characters to love … and others you will love to hate. We are also now seeing this world through three more set of eyes—those of Lyria, Ephraim, and Lysander. It’s a fresh perspective to this universe that until now we’ve only experienced through the eyes of Darrow. The added point of views allow us to appreciate the Red Rising world in a way that expands our view of both the Society and the Republic. They say history is written by the victors, so what if you could see the world through the eyes of those who lost? Even more, what if you could see the world through those who were part of the collateral damage? I found myself conflicted at times, wondering if I had been too caught up in the Reaper’s glory to see the flaws and potential repercussions of his actions. Too enamored by my favorite character (Yes…Sevro) and too high on my personal vendetta against the villains in the story to think back on all the other lives that were also lost but never mentioned. Then I wondered, aren’t the best heroes those who are flawed, those who have to battle their demons and make the sacrifices that many of us wouldn’t be ready to make? And, shouldn’t that be enough for redemption? Or should the heroes be held accountable for their mistakes, regardless of the price they’ve already paid? Regardless of our love for them? Walking in Lyria’s, Ephraim’s, and Lysander’s shoes made me contemplate the reality of war. It is not just about destroying a villain and tearing down a corrupt institution, it’s about healing and rebuilding. It’s about leaving a place better than we found it. But what if that’s not enough for someone who lost everything in the name of the greater good? What if your ghosts literally come back to haunt you? Well, don’t get too comfortable in your chair because before you are done philosophizing about this incredible universe, in the words of Sevro au Barca, “S*it escalates” and very quickly. Core to Rim, you’ll fall in an Iron Rain, experience genocide, get captured, take part in an Ocean’s Eleven type heist, participate in a nerve wracking prison break, and go on a potential suicide mission that will leave you breathless. Darrow’s motley crew of Howlers will have you jumping into a StarShell, diving into oceans, and traveling to different planets, and pretty much partaking in their usual death defying antics before you can finish your burner. Everything you’ve loved about Pierce Brown and his masterful storytelling comes together in a novel that will have you sitting at the edge of your seat, reading until the late hours of the night and into the dawn. Your gut will wrench, your heart will break, and your mind will be blown. Get your razors ready, Howlers! This ride is just beginning.